Have you ever used the chipotle in adobo peppers you can usually find the Mexican or ethnic aisle of your grocery store? I absolutely love them. They have such awesome flavor. I add them to chili, salsa, taco meat, and all kinds of things. The adobo sauce adds such a great smoky heat. Chipotles in adobo are dried, smoked jalapeno peppers cooked in a sauce of spices like cumin and garlic among other things, vinegar, tomato sauce and ancho chilis, there is often a little brown sugar added too. They are spicier than a jalapeno though so be careful. If they are too hot for you, you can scrape out the seeds to cut down on the heat. The ones I buy come in a small can that looks like this. 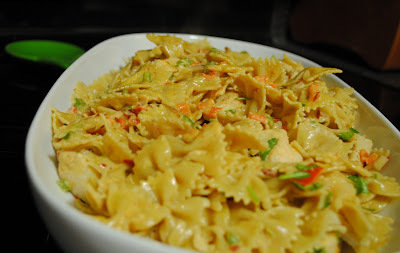 As for this pasta, I wanted a spicy pasta with a light cream sauce. I added lots of bell peppers, onions, and cilantro to give it extra flavor. I let the chicken marinate in a little lime juice, cilantro and spices for about half an hour before cooking it to give it some extra flavor. I used whole wheat pasta to make it a little healthier. I've cut back on the chipotles in this recipe from the way I made it the first time. Although I was fine with using three chipotle peppers, my husband thought it was just too spicy so I would start with one pepper and taste it along the way. That way you get the flavor but adjust the heat to suit your own tastes. I didn't take out the seeds. Remember though that it will get a little hotter as it cooks. I used farfalle or bowtie pasta but feel free to substitute whatever shortcut pasta you would like. This makes a lot of pasta - about 8-10 servings. Trim fat from chicken breasts and cut into bite-size pieces. Combine lime juice, 1/2 of minced garlic, 1/2 of cilantro, chili powder, and salt and mix together. Pour over chicken to coat and marinate chicken about 30 minutes. Heat a large pot of water to boiling. Add generous amount of salt and add pasta. Cook according to package directions until al dente. Drain and set aside. Meanwhile, add olive oil to large saute pan and heat over medium heat. Add chicken, bell peppers, onions and remaining garlic and cook about 6-8 minutes until chicken is cooked through and vegetables are softened. Add chicken stock and chipotle pepper and adobo sauce and cook until stock is reduced by about 1/3. Reduce heat to low and add cream and cheese. 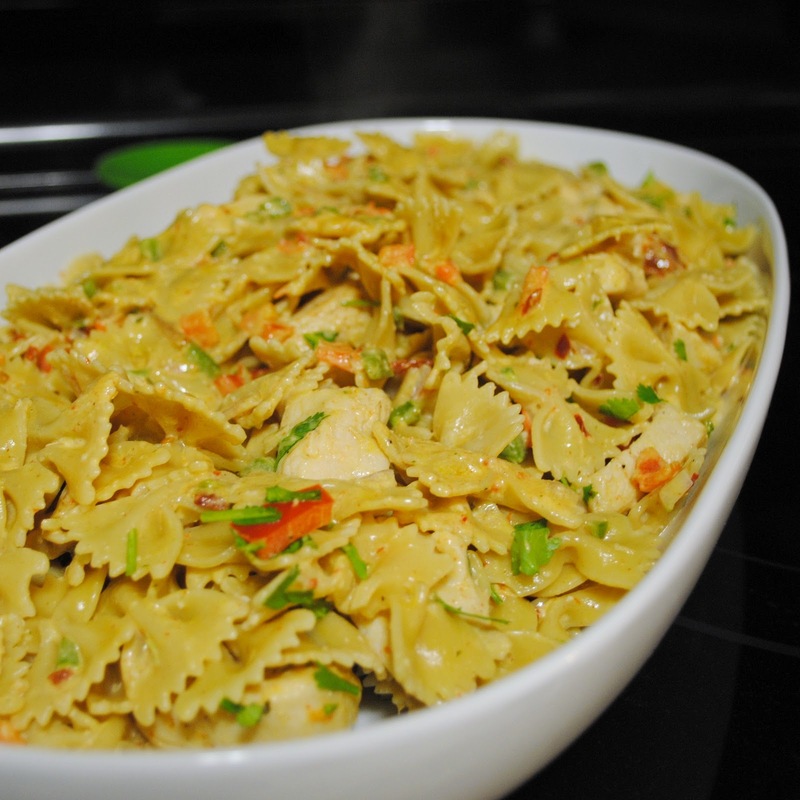 Stir to combine and return pasta to sauce pan and toss to evenly coat with sauce. Cook about 5 minutes and top with remaining cilantro and serve. I love using chipotle in adobo in vegetarian bean dishes to punch up the flavor. Great! Your pasta sounds delicious! 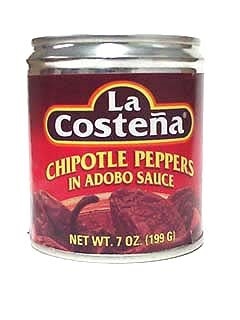 I love the chipotle peppers in adobo sauce and will try it with pasta now. Thanks! Super great idea, I have used them in rice dishes but not pasta yet. Great idea, I also adore the intense flavor and heat they add. I'm making this tonight. It looks awesome and caught my attention as soon as I saw it. Can't wait for dinner! I couldn't wait to try this recipe out. I hope you don't mind, but I posted about my attempt with this on my blog. (Giving credit & linking to your post, of course). The flavors in this combine so well. @kammie - of course I don't mind - glad you enjoyed it!